IF YOU’VE PEEKED through the curtains this morning, or braved the roads to get to work, you’ll know that it’s another foggy day outside. Met Éireann tells us that the fog and frost will clear this morning, and that it “will continue to be dry with sunny spells”. Motorists should drive carefully and use their fog lights where necessary. We can also expect light winds and top temperatures of 10 to 12 degrees today. But tonight, the frost and fog will return to many places. In northwestern areas, it will clear as the cloud increases, while rain will hit much of Ulster and Connacht, says Met Éireann. Lowest temperatures tonight will be -1 to +1 degrees over Munster and Leinster. If you’re in Ulster and Connacht, it will be slightly warmer, with the lowest temperatures expected to reach two to five degrees. Dublin Airport is reporting some delayed flights this morning. There are no national warnings in operation, unlike yesterday. 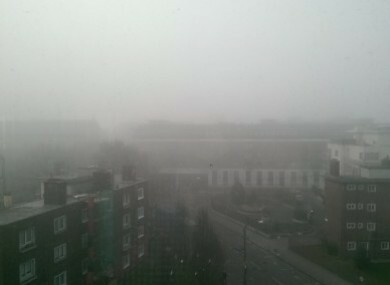 Email “Careful on the roads - it's foggy out there this morning”. Feedback on “Careful on the roads - it's foggy out there this morning”.